First, in my opinion, Nurmagomedov must of been on drugs. There is no way that "talk" causes a reaction of jumping into the audience to fight. And, the rivalry between Ireland & Russia, didn't know there was one, but since there is-- it's still no cause for this type of irresponsible action on Khabib's part. Second, the reaction from Dana White is a little suspect to me. From the playback, it appeared the scene turned into a WWE battle royale, and somewhat appeared to be staged. If it wasn't staged, how would one explain Dana's reaction? 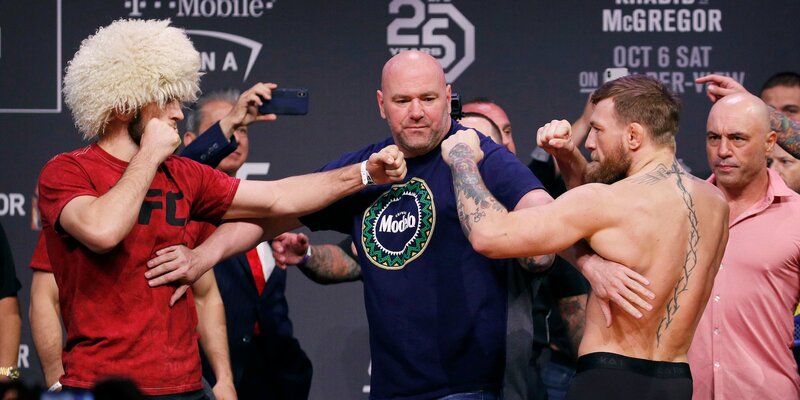 It's the biggest night, ever, for UFC, obviously spurred on by the popularity of McGregor coming-off the Mayweather fight; they should be thanking Floyd every change Dana, UFC & McGregor get. Let's stay on 'second' for another paragraph. How do you explain Dana's attitude? The Governor of Nevada was in the arena, he had to be rushed out, the more than probable law suites which are coming, we know they are coming because- with that maylay-- someone had to have gotten injured. He (Dana White) isn't in dismay? He's calm as can be, which makes it look as if it were staged. Plus, he still-- when I turned it off-- was prepared to let Nurmagomedov talk at the post fight. McGregor wasn't pressing charges? And, the ramifications seemed to be less than what would be expected. Third, with all of the excuses the talking heads where coming up with to protect Khabib, as if they were his PR, you'd think he just, a few seconds before, wasn't using his hands, and body, that are considered lethal weapons, to pound on someone in the audience. The collective attitude of the announcers, Dana White, McGregor toward Khabib, a man who they say wasn't experienced in the pre-fight buildup, where insults are hurled like body-blows to build interest in the fight, was somehow overwhelmed, so, mentally, by the pre-fight insults, that he couldn't control himself after winning against McGregor. The same Nurmagomedov who wore a blond afro wig after defeating Michael Johnson; we know what the truth about Russia is concerning anti-Black rhetoric and mentality, especially us who have researched and have learned how the caucusoids forced the original Russians out. Oh-- the original Russians where Black. Do the research. Which brings me to my close. What would the attitude toward Khabib Nurmagomedov's post maylay have been if he were Black? Let's setup the reality of the night. The Governor was there, rushed out of the arena, thousands, if not millions were spent to secure the venue, the audience was subject to a mad push/rush of bodies involved and avoiding the after fight, Metro had to enter the Octagon, and McGregor was assaulted by one of Khabib's teammates. What would have happened, and what would be the attitude concerning the finish of the night, if Khabib Numagomedov and his team were Black? And, with having the answer to that question be so obvious-- the same aftermath: charges, fines, suspensions, loss of passport, etc., etc., etc., should happen to Nurmagonmedov.